Bucks County authorities returned to the DiNardo farm property in Solebury Township on Thursday. There was a noticeable increase in activity on the property since last week when the bodies of 4 missing men were discovered buried. 20-year-old Cosmo DiNardo has confessed to the murders of the men. His cousin, 20-year-old Sean Kratz, has been charged in three of the killings. Today, police officers were combing the entire 90-acre property. Philadelphia K-9 units were also involved. The Bucks County District Attorney's Office plans to release the crime scene soon and wants to make sure they have covered all their bases. "Because of that, and because of renewed probable cause would be required for us to revisit the property once it is released to its owners, we want to make absolutely certain that we have not missed any evidence before departing," said Larry King of the District Attorney's Office. 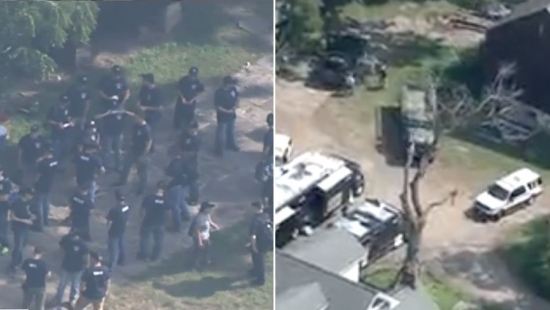 "To that end, and because of the vast size of the property itself, a large number of law enforcement personnel, police cadets and others, including horses and dogs, are required for this compromise walk through." DiNardo and Kratz have a preliminary hearing scheduled for July 31st. Philadelphia police are searching for a 25-year-old man wanted in the stabbing of two women in South Philadelphia early on Thursday morning. It happened just before 2 a.m. outside the residence on the 2700 block of Daly Terrace. The man was angry over a recent break-up. He stabbed his 21-year-old ex-girlfriend and her 48-year-old mother. The mother was taken to Hahnemann University Hospital in critical condition and died shortly after arrival. The daughter was taken to Penn Presbyterian Hospital and remains in critical condition. Real time cameras caught the suspect fleeing the scene. Authorities have his name and last known address. He has been arrested before. Police were called to the same address earlier this weekend for an argument between the couple. Anyone with information should call police. Philadelphia Police say that a 65-year-old woman is under arrest after she hailed a cab, then stole it, and proceeded to pretend to be a cabbie and picked up a fare. It started around midnight on Thursday when the woman flagged down a cab and asked to be driven to Sugarhouse Casino. Along the way she told the real cab driver to pull over at a gas station near Broad St and Hunting Park Ave so she could buy a drink. The driver got out of the vehicle to help the woman who had trouble walking. The woman, however, jumped into the driver's seat and pulled away. When police spotted the cab about a half hour later and pulled her over, there was a woman and a 10-month-old baby in the back seat. The passenger had no clue the cab was stolen, she had just hailed the cab and was picked up as usual. The woman is in custody and will be charged with stealing a car. UPDATE: Betty Thomas, of the 100 block of East Mayland Street in Philadelphia is charged with Theft-Unlawful Taking, Theft of Services, Theft-Receiving Stolen Property, Terroristic Threats, and Unauthorized Use of Auto. This afternoon, Heat Warning, Partly Cloudy, temperatures in the mid 90's in Center City.